Legislation to expand Interstate 14 from Texas through Central Louisiana and into Mississippi has been introduced in Washington, D.C. The highway would link numerous military bases. The bill was co-sponsored by Reps. Mike Johnson and Ralph Abraham. “Expanding I-14 will create numerous opportunities for Central Louisiana to grow. Interstate access means commerce, development and jobs. It means Fort Polk can deploy troops faster and more efficiently", Congressman Ralph Abraham said. Others cosponsoring the bill include U.S. Reps. Mike Conaway, R-Texas; John Carter, R-Texas; Kevin Brady, R-Texas; and Greg Harper, R-Miss. 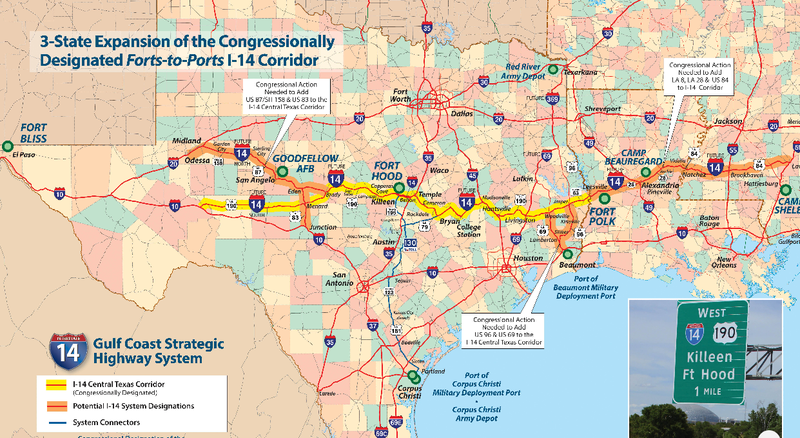 To view a map of the proposed I-14 corridor, click here.